YouTube’s tempering its plans for high-end video productions, which includes Hollywood-level scripted dramas and comedies. YouTube’s announcement came the same day Apple announced original content of its own. The move was a bit of a calculation for YouTube, which saw its ability to bring in $15 billion in ad sales in the past year without the billions of additional investment required to compete with the likes of Amazon or Netflix when it comes to original, high-quality content. Instead, it will continue to create exclusive content, but it won’t be investing the production dollars to compete with the likes of Amazon’s Lord of the Rings series, for example. The announcement shows just how fraught the category is at this time. Yahoo tried to save its business with the launch of high-end original shows shortly before its demise in an effort that was ultimately scrapped. Microsoft started and then cancelled its high-end sci-fi show based on the Halo franchise. And now new players like Apple and Disney are entering what is already a crowded space with original content of their own. This isn’t the first time YouTube has dabbled with high-end content, but that’s really all it’s ever done… dabbled. Now, it may stay in its very lucrative niche. While everyone else goes high-end, YouTube seems content to play primarily at a low- to mid-tier content level with some higher-end efforts like YouTube’s original scripted show Cobra Kai being outliers. Apple’s newfound emphasis on services is now in full swing as the company announced moves beyond productivity to entertainment at a much-hyped event this week. The first announcement was Apple News+, a $10 per month subscription that gives users access to more than 300 magazines and publications like National Geographic, The New Yorker, Variety and others. The service doesn’t include everyone. For example, The New York Times is noticeably absent because Apple will control a lot of the data on users as well as keep 50% of the subscription fees. Users will not be able to be tracked or targeted in ads served on Apple News +. Apple News+ will work across Apple devices. This one will be interesting to watch as Apple exerts a lot of control here, enough control in fact to keep some publishers away. Still others, clearly found Apple’s potential to give their publications scale, and if Apple can recruit enough users to the service, those who sat it out may be looking to get brought in. Then Apple introduced an extension of Apple Pay with a credit card of its own. The card is available in the Wallet app, and a physical card made out of titanium will be launched this summer. Like most credit cards, it offers its users some rewards and requires no annual fee, late fees, hidden fees, international fees or over-the-limit fees, but what seems to be the most interesting feature is the interface within Apple Wallet that lets users track their spending. Next, Apple announced a new gaming service called Apple Arcade. Apple Arcade is a section of the App Store with access to 100 exclusive gaming titles users can access Netflix-style for a fee. The games are being developed by some of the top gaming studios. All of the games will be ad-free and will not include in-app purchases. Pricing for the service has yet to be revealed, however, but families who subscribe will be able to pay one fee and share access between six people. Finally, we got an update on the long-awaited Apple TV and Apple TV+. The TV app for Apple is launching across platformsnow, including non-Apple devices like Samsung smart TVs, Roku devices and Amazon devices. The app will allow users to integrate “hundreds” of their streaming services (referred to as “channels”) under a single interface with the app update, similar to Amazon and Roku channels. Users will need to still subscribe to each of these “channels” separately to have access to them within the TV app. Notably, Netflix will be absent from the list of available channels and will only be accessible as a separate app. This interface will allow users to access any streaming platform’s content through the TV app instead of opening up separate apps. Amazon Prime Video and Hulu, however, will still require users to open their apps to watch content, even though they’ll be available under the TV app as a “channel.” There’s good reason for Hulu, Amazon and to an even further extent Netflix to hold back. These are major platforms and data is critical to their businesses. Apple’s offering scale, but they don’t need the scale some other “channels” do, and in turn, they’re not ready to trade their data to be more integrated into the TV app. The star announcement around Apple TV was Apple TV+, a new video streaming service complete with exclusive shows only available to subscribers. Pricing was not revealed, but we do know Steven Spielberg, Oprah, Jennifer Anniston, Jason Momoa, Steve Carrel and others will be creating content for the service. The service will be joining a crowded marketplace of competitive streaming services. Pinterest has officially filed for an IPOand will be listed on the New York Stock Exchange as PINS. Along with the filing we got more information on how well the platforms performing. It has 250 million monthly active users and generated more than $755 million in revenue in 2018, 60% more than the previous year. It recorded a $63 million loss in 2018, which was down from 2017’s $130 million. The platform is going all-in on advertising by making the case that people on Pinterest are looking for products, making it an ideal place for advertisers to reach them and even sell them products directly on Pinterest. Google has launched the Local Experiments Project, a new program that is meant to fund local news websites, initially in the United States but eventually around the world. Google will specifically be funding partners that it deems have local news expertise. The announcement comes a week after Facebook announced a program to support local news initiatives and after both Facebook and Google came under criticism for being active participants in the decline of local news. Facebook is banning white nationalism and white separatism content from Facebook and Instagram after coming under fire for how it handled the spread of nationalist content following the attack on a mosque in New Zealand. Facebook announced, “Going forward, while people will still be able to demonstrate pride in their ethnic heritage, we will not tolerate praise or support for white nationalism and separatism.” Beyond that, users who search for such content will be given a link to a group dedicated to helping people transition from hate groups called Life After Hate. Google has launched AMP for Email, an extension of its existing AMP efforts to make mobile pages load more quickly and perform better on mobile devices. AMP for Email will allow senders to integrate more interactive elements to their emails, essentially making them light, interactive web pages. For example, a hotel could let users browse rooms from an email. The emails will be supported by Gmail, Outlook, Yahoo and Mail.RU. Instagram Stories ads are getting more of the interactive elements users have become accustomed to. Now, advertisers will be able to add poll stickers to their ad units. The polls can be added in Ads Manager when uploading creative. 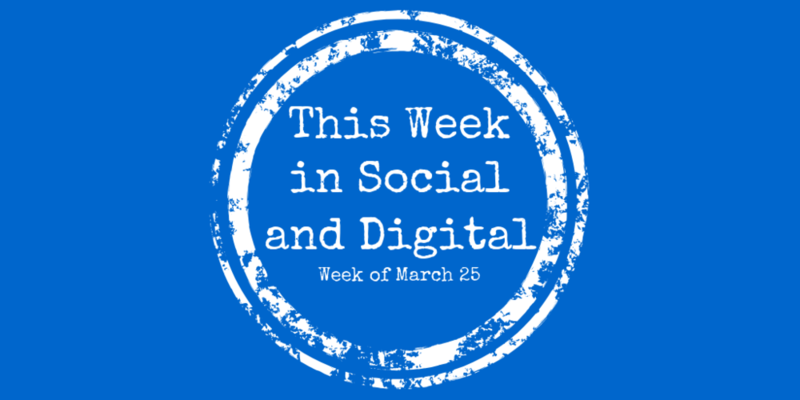 Posted in This Week in Social and tagged with This Week in Social, Social Media, Digital, Marketing, Advertising, News. March 31, 2019 by Taylor Wiegert.